Why discuss the challenges posed by Emerging Technologies at this time ? In the era of Automation and Artificial Intelligence, Corporate Leaders are constantly facing an expanding Risk Universe. Cyber crime, malware, Data Security breaches, Information theft and extortion have long afflicted the virtual world. Additionally, there is also the rising risk of software bugs in physical equipment which is designed using digital controls, such as electric cars, medical equipment and drones. As per a recent news article from WSJ, investigators of two deadly crashes of Boeing Co. 737 MAX airliners are wrestling with the vital issue of hybrid of old and new technology, where a complex piece of software controls hydraulic pumps and motors. Digital retrofits to old equipment like the 737 MAX’s anti-stall system is suspected of having contributed to both the crashes that claimed a total of 347 lives. The tremendous negative impacts of combining smart technology with old machines have compelled Corporate leaders to rethink the strategy of innovation and automation. With rise in IoT (Internet of Things), the cost and size of digital sensors is decreasing and the ability to transmit data is increasing and as a result more physical objects are getting linked through software. Be it smart-home devices controlling oil-burning furnaces or mainframe computers overseeing decades-old power grids, digital controls are coming up everywhere around the mechanical world. Software has supported the internet’s virtual world from inception, and has demonstrated its productive potential as well as vulnerability. Just at the time when Internet of Things is on the verge of becoming a pervasive reality, technology experts and public-safety professionals are stressing over the critical intersection of virtual and real , most popularly known as cyber-physical security. What this recent article in WSJ highlights is the issue of engineers putting mechanical systems under the command of Computers and algorithms without fully understanding, anticipating and testing the results. These high impact Risks include confusion about how controls work, software bugs resulting in physical accidents and cyber attacks on infrastructure like power stations or chemical plants that could cause catastrophes. While Automation and Artificial Intelligence offer huge benefits, even for decades-old mechanical equipment, integrating computers into “dumb” machines poses challenges. So now how do we respond to this dilemma ? 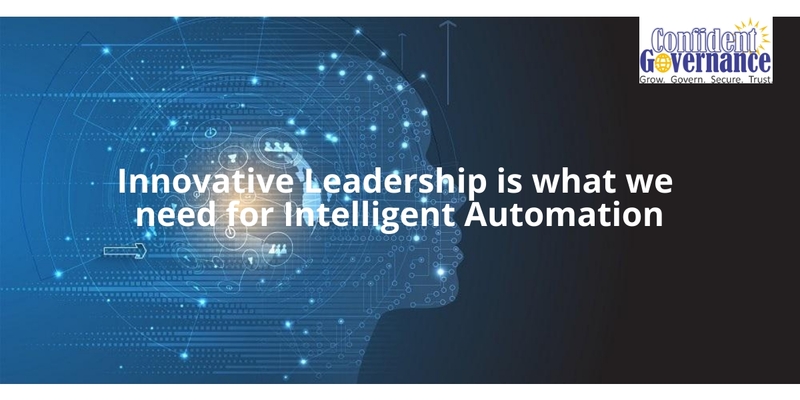 The answer is Intelligent Automation that requires Creative and Innovative Leadership. Conventional Leadership was all about bringing the best of the Corporate workforce, while Innovative Leadership is all about leading machines, robots and algorithms. This concept resides on the base knowledge that while Creativity always remains in the realm of human beings, only the repetitive tasks should get intelligently automated. As the cost of Intelligent Automation declines, it will become a competitive advantage. However, Businesses will need to consider following key factors in order to take full advantage of the potential of Intelligent Automation. Real time Information management: Acquiring, Analyzing and Preparing information assets for machine learning applications. Agile Risk management : Continuously monitoring, assessing and mitigating a huge array of Risks from cyber threats and privacy breaches. The concern on advanced Automation and AI isn’t malevolence but is that of competence. The main objective of keeping Automation and AI’s impact on society beneficial fuels research in many areas from economics and law to technical fundamentals of Verification, Validity, Security and Control. It is important that an AI system does what you want it to do whether it be controlling your car or an airplane. An Intelligent Automation and AI can be extremely good at accomplishing its goals, but if these goals aren’t aligned with ours, there is a big problem. Because AI has the potential to become more intelligent than any human, we have no full proof method of detecting how it will behave. The only way Technology can be made more productive and less destructive is by Creative and Innovative “Human” Leadership. Stay tuned for more insightful and exciting posts on Emerging Technologies, Leadership, Governance, Risk, Cyber Security, and Compliance.